Blog by Kingdom Insurance - Friggateriskaidekaphobia! No, it’s not a swear word from some Norse tongue! 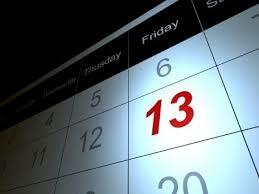 It’s the name for fear of Friday 13th – friggatriskaidekaphobia. What has that got to do with insurance, you may wonder? Well, quite a lot, as it happens. I was extra careful driving out on the roads this morning, what with it being Friday 13th (as well as the frost and wind! ), not because I suffer from friggateriskaidekaphobia, but I’ve seen the data from insurer Aviva. They analysed claims data from the past 10 years, and it seems that something funny is going on each Friday 13th. They reported that there is a 13% spike in motor collision claims on Friday 13th compared to other days in the same month. This applies year round, not just because there’s a frosty morning or a wet spring or a super sunny day! Friday the 13th does indeed appear to be the unluckiest of Fridays, with the highest combined number of motor insurance claims overall, to include, fire, theft, accidental damage, third party damage, third party injury and windscreen damage. Friday the 20th seems the luckiest of the Fridays, with the lowest combined number of claims. Motorists were 16% less likely to have an incident on the 20th compared to the 13th. Friday the 6th was lucky compared to the 13th or 20th when it came to third party injury claims and fire claims with the lowest number of these occurring. Motorists are 10% less likely to have an incident on the 6th compared to the 13th. Almost one in ten drivers (9%) said that that they keep a lucky charm in their car and 5% said they believe getting bird mess on their car is a good omen. I’ve never heard that one before. I can’t see underwriters asking these questions to see if you should qualify for a discount! 1) 50% use the phrase “touch wood” in the hope that something bad won’t happen. 2) 43% avoid walking under ladders. 3) 36% avoid opening an umbrella indoors. 4) 30% will not place a pair of new shoes on a table. 5) 26% believe Friday the 13th is an unlucky day. Around two-thirds of people (63%) admit to holding some superstitious beliefs, just one quarter of us (26%) believe that Friday 13th is an unlucky day, according to research from the insurer. For the superstitious, travelling on Friday 13th is often a worry and now, travel insurer Staysure has found that the number of incidents and injuries reported by customers does actually increase by 12% on the much-feared date. Claims data shows that incidents reported include an increase in medical emergencies – although cancellations did not show an increase. Since July 2013, there have been only seven Fridays that fall on the 13th. The 13th of May was the only ‘Friday 13th’ in 2016. This year we have two, today and again in October. The date has long been associated with bad luck and many travel operators cater to the superstition, allowing holiday makers to avoid the number and its perceived doom at all costs. In some airports, there is never a call to “gate 13”; Air France, Ryanair, Lufthansa and Air New Zealand have all chosen to remove row 13 from their flights and certain hotels strategically rename their 13th floor things like The Pool Floor or use it for storage. Travel agents may be quieter today as many individuals will choose to avoid making any bookings on this day… simply because of the fear behind the date! Still, it’s not all bad news. According to flights specialist Kayak, it costs an average of £52 less to take to the air on a Friday 13th compared to a typical Friday, because of superstitious passengers being reluctant to get on a plane. So get over your fear and take advantage, then call us to take out your travel insurance. Lastly, home insurance. Strangely here, the trend is reversed! Britons suffer fewer accidents at home, data suggests. I can only presume that those who are too scared to go out on the road, knowing there is a 13% higher risk of being in a car accident, stay at home and do absolutely nothing! Accidents in the home, for example, are apparently less severe on Friday 13th than they are in any other day of the month. The cost of claims for breakages and thefts at home are much lower on the day, according to home insurer, Policy Expert. Of their customers who made a home insurance claim on Friday 13th June in 2014, the claim was £1,341 cheaper on average than those occurring in the rest of the month. On Friday September 13th 2013, the average claim value was £1,192, which is £563 cheaper than the rest of the month. On Friday December 13th, 2013, claims cost £985, or £1,422 cheaper than the average for December. Typically, there are half the number of claims on Friday 13th compared to an average day, the insurer said, suggesting that people tend to extra care around the unlucky date. Despite this, one in ten Britons say they would try to avoid all association with the number 13, and 14% said that they would not buy a house or flat if it was number 13, according to a survey of 2,017 people by comparison website GoCompare. What I would say, is that I hope these figures will help encourage you to take extra care today, especially avoiding black cats in your path and definitely don’t open an umbrella in your car! Best of all, stay home!